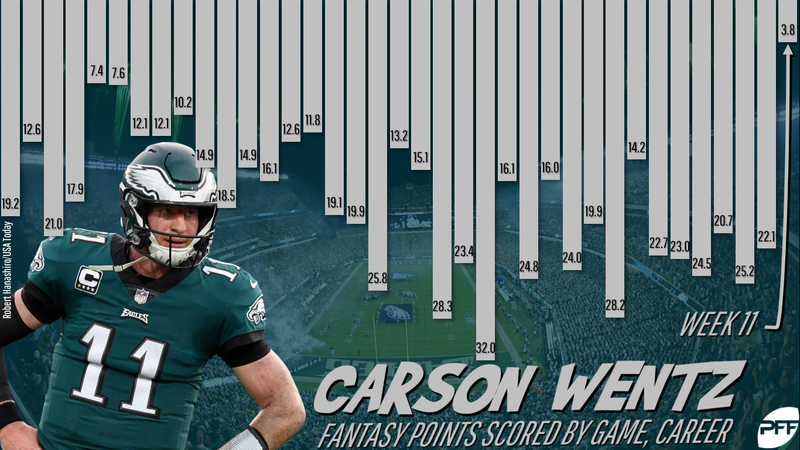 As we head into Week 12, it’s time again for our weekly look at the fantasy football players on the rise or fall in the weekly rankings. It’s Thanksgiving week and we’ve reached the point of the season where there is little margin for error. As each week goes by, we have new information that is presented to us and it requires careful consideration. Once again, in Week 11 Luck threw for three TD passes and has now hit that mark in seven straight games dating back to Week 4. During that span he’s averaged 301 passing yards per game and only Mitchell Trubisky and Patrick Mahomes have scored more fantasy points at the position. … For the second straight week, Brees didn’t play all four quarters as the Saints were in a blowout. Despite the early exit he still offered more fantasy production than any other QB on Sunday. He threw for four scores and delivered 363 yards through the air; including an impressive 13.3 average depth of target. … Winston came in off the bench and nearly led the Bucs back vs. the Giants with 199 yards and two touchdowns on 12-of-16 passing. Barkley now hit 20 PPR points in nine games. Only Eric Dickerson had more as a rookie, with 10 outings with 20 or more fantasy points during his debut season with the Rams in 1983. … Jones has arrived as the fantasy RB1 many always expected he could be if given the opportunity. Over his past two games he’s scored four touchdowns and compiled 275 yards of total offense one 34 touches. … What Lindsay is doing in Denver continues to be one of the best stories of the season. The undrafted running back scored two touchdowns and had the best fantasy output (26.6 PPR points) of his short career in Sunday’s upset of the Chargers. … Adams scored his first NFL TD in Week 11 and is now averaging 7.0 yards per carry and 3.6 yards after contact per attempt over his last three contests. He has emerged as the leader for snaps in the Eagles’ backfield could have flex appeal down the stretch. … The most surprising performance at the position in Week 11 was turned in by Edwards in Baltimore. He produced a 17-115-1 stat line and his familiarity from being on the field with Lamar Jackson in the special packages the Ravens run seemingly worked in his favor. For the ninth time in 102 career games, Hilton broke the 30-point mark as he pulled in all nine targets for 155 yards and two scores while posting a 12.44 average depth of target. 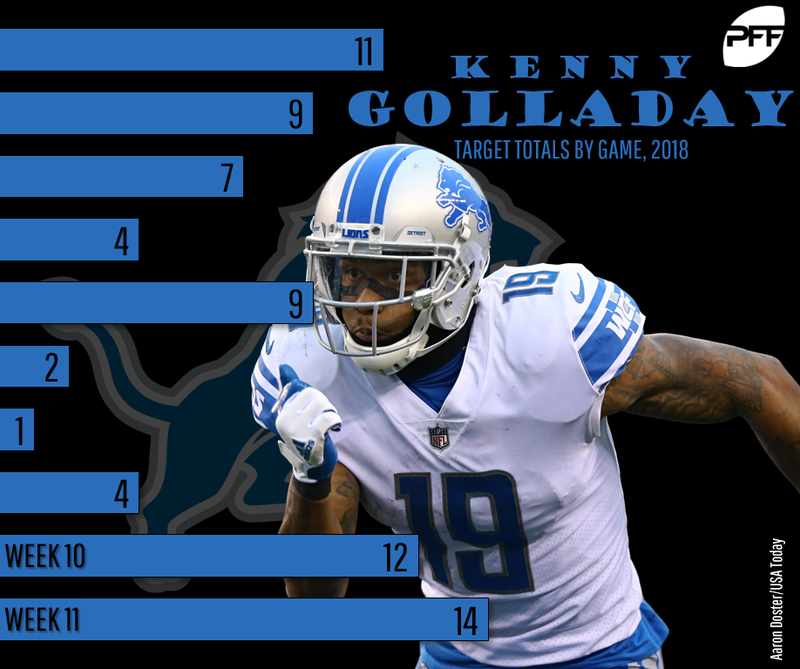 … Golladay had to shoulder a bigger load in the passing game with Marvin Jones (knee) out and saw a season-high 14 targets. He responded with an 8/113/1 stat line. … After a slow start to the game, Evans got it going once Winston came off the bench and delivered his best fantasy output of the season. He had six catches for 120 yards and a TD and got credit for a second touchdown when he recovered a Winston fumble in the end zone. … Owners were happy to welcome Diggs back to their lineups after he missed Week 9 and had a Week 10 bye. He made up for lost time with 18 targets for 13 catches, 126 yards and a touchdown as the Vikings went pass-heavy early in their loss to the Bears. … One week after not getting a target, Smith was targeted 13 times and on 43.3% of his routes. Only A.J. Green in Week 7 was targeted on a larger percentage of his routes (min 20 routes) in a single game this season. After appearing in the “Fallers” section more than a few times this season, Reed finally showed some signs of fantasy life in Week 11 once McCoy took over at quarterback for the Redskins. He reeled in seven of 11 targets for 71 yards a TD. Reed and Alex Smith never clicked, but a change at QB may breathe life back into Reed’s value. … Game flow was a factor for sure, but the fact that Smith saw eight targets was encouraging. He could see his role expand down the stretch for the Titans. … Gates scored his second TD of the season against the Broncos and was second on the team in targets while finishing with 80 yards. This was only the third time in the 25 games Gates has played since the start of 2017 in which he posted double-digit PPR points. Wentz delivered the worst fantasy performance of his career in Sunday’s loss in New Orleans, getting picked off three times and going without at TD pass for the first time in his last 23 starts. His 156 passing yards equaled the second-lowest output of his career. … It seemed inevitable that Fitzpatrick would get benched sooner or later and it came Sunday in New York. For the second straight week he was held without a TD pass and was picked off three times, taking his total to 12 interceptions on the season and seven over his last three outings. … Stafford was able to avoid costly mistakes and help the Lions to a win over the Panthers, but he only passed for 220 yards and one TD. After throwing for 280 or more yards in three of his first four contests in 2018, he has failed to reach that mark in six straight games. After waiting for Cook to get healthy and through his bye week, owners were treated to a Week 12 matchup with the Bears. The good news is he played a career-high 59 snaps. The bad news is he finished with 12 yards on nine carries and had two catches for -2 yards receiving. … Lewis was held to just 24 yards on 10 carries in the loss against the Colts, but the bigger disappointment was the fact he was only targeted twice in the contest even with Tennessee being down big most of the game and finished with one catch for two yards. … Collins scored a 7-yard touchdown in the first quarter and then mysteriously was faded out of the game plan for the Ravens as they turned to Edwards. Collins has now scored five times in as many games, but the fact he only had one carry in the second half Sunday vs. the Bengals is concerning. Jeffery hasn’t scored double-digit fantasy points since Week 7. He produced his lowest yardage output of the year in the Eagles’ loss in New Orleans. He’ll look to right the ship against in Week 12 against a Giants team he produced his best stats of the year against in Week 6. … One target. No catches. Zero points. After appearing that he may be able to recoup some of his fantasy value during his debut with the Texans, Thomas’ second game in a Houston uniform was a disaster for those who stuck him in their lineups. … With Jackson taking over at quarterback for Baltimore both Crabtree and Brown fizzled. 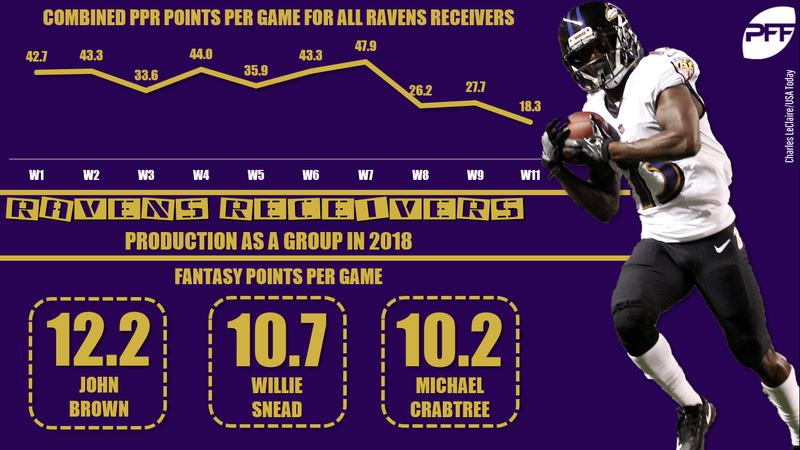 If the Ravens stick with the rookie under center any Week 12 fantasy value either veteran receiver offers will quickly fade. … Valdes-Scantling only garnered three targets versus the Seahawks despite Randall Cobb be inactive once again Week 11. The rookie posted either 100 yards or a touchdown in four of his last five games coming into the matchup, so the upside is there with Rodgers throwing him the ball just expect some rough patches. We’ve seen the ceiling and we’ve seen the floor with Ebron. He went without a single target a week after scoring three touchdowns. The problem with the Colts’ tight end is that he’s not seeing enough snaps and targets to offer consistency. He played on just 25 of the offense’s 62 snaps in Week 11. … Burton saw just one target in the Bears win over the Vikings and has four in fewer receptions in all but one game this season. … Not only did Seals-Jones get held to just one catch on two targets, his costly late-game holding penalty wiped out a would-be game-clinching touchdown by David Johnson.